So, ya know how you have those secret fantasy jobs, that if you weren't doing what you were doing you would do x...? Mine consist of doing preservation work at the Met (like Sigourney Weaver in Ghostbusters), being a professional break dancer (is this even a thing? ), a water ballet star a la Ester Williams, and being the color specialist for the fiberglass shell chairs at Modernica. When I was at their warehouse a few months ago I stood there mesmerised watching the chairs being made. I talked to the guy in charge about working there and coming up with and perfecting their colors, and he informed me in a you-need-to-simmer-down-ma'am voice (that i get all too often) that they had a man who already had this job. Anyway, all this to say that Modernica is having a Color Contest right now for a new limited edition run of shell chairs. My head spins with how many things I love about this. 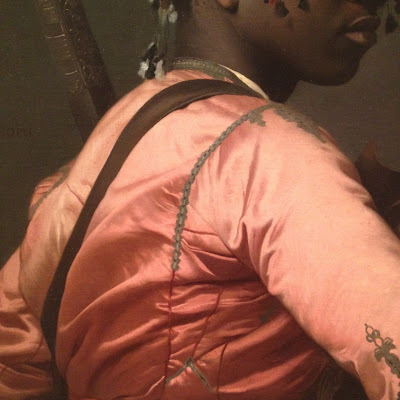 But, the important thing is that I submitted my color, which is called Gérôme Pink and inspired by one of my favorite paintings at the Met (above). I am in love with this color (and is second to my favorite shades of "non color" colors, and this shade of faded yellow, which I have a tube of Sennelier paint in the studio that I covet, but yellow is such hard color to reproduce, so.... here we are). Here is what I ask of you kind reader, give me a click and "like" this shade! I would be oh so grateful! it´s a perfect shade - i´d live to have a chair in that colour... and that job of course, it just sounds like perfection! so i used elijah's facebook to like it!! I HOPE THAT YOURS GETS PICKED WOOHOO!!! (if so, we're getting one...)! you are so cute! Lilijah!